The historical exhibition entitled "From the history of Mrągowo and its vicinity” is a continuation of the archaeological exhibition by presenting artefacts concerning the more recent history of our city. Naturally, few material proofs of life and activity of the people inhabiting the Mrągowo region from the more distant ages survived. That is why the exhibition, taking the timeline of the history of the city as a starting point, is not able to document every one of its points with artefacts. 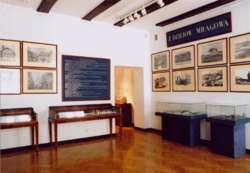 The exhibition shall present both old maps from various historical periods, documents, photographs, items related to important historical events or people, who played a major role for the city or the region, as well as memoirs from the first years after the war, when the foundations of the present day Mrągowo started to develop. The presented items mainly come from the Voivodeship State Archive and from the collections of the Mrągowo museum. To fully illustrate the presented topics, materials on loan from other museums and scientific institutions, as well as from private collections shall be used. Among the most interesting artefacts, one should distinguish the portrait of K. C. Mrongowiusz, original municipal seals from the 17th and 18th centuries, old parish registers, municipal coins, the city panorama from the beginning of our century. The exhibition is complemented by colour photograms of Mrągowo's most interesting monuments.